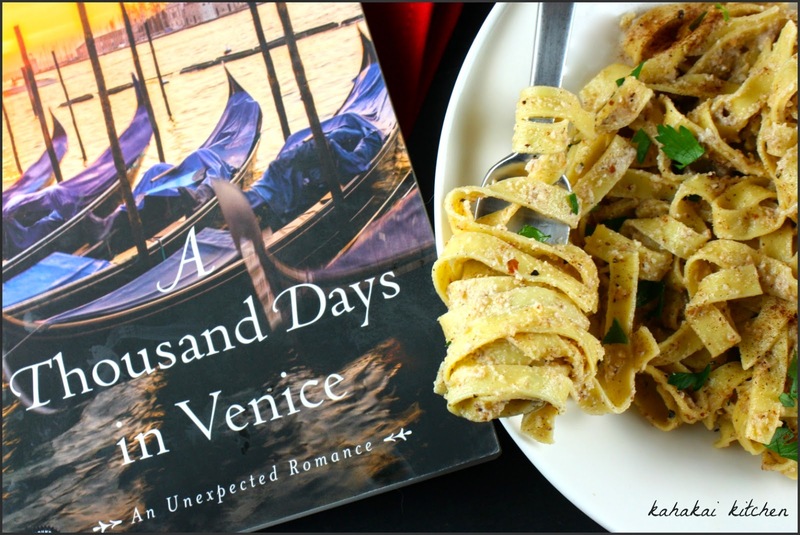 "You have il regalo," Nonna told me one steamy August evening before I left for college. The gift. A light touch, an instinctive to substitute and improvise. I knew I had it--it was one of the few things I was certain I did well. 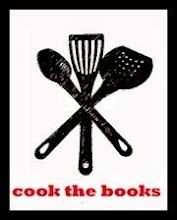 Though hopeless at chemistry in the classroom, I intuitively understood the alchemy of cooking." Angela can feel the clock ticking. She is single in New York City, stuck in a job she doesn’t want and a life that seems to have, somehow, just happened. She inherited a flair for Italian cooking from her grandmother, but she never seems to have the time for it—these days, her oven holds only sweaters. Tacked to her office bulletin board is a photo from a magazine of a tidy cottage on the coast of Maine—a charming reminder of a life that could be hers, if she could only muster the courage to go after it. On a hope and a chance, Angela decides to pack it all up and move to Maine, finding the nudge she needs in the dating profile of a handsome sailor who loves dogs and Italian food. But her new home isn’t quite matching up with the fantasy. Far from everything familiar, Angela begins to rebuild her life from the ground up. Working at a local coffeehouse, she begins to discover the pleasures and secrets of her new small-town community and, in the process, realizes there’s really no such thing as the way life should be. Angela envisions a very different life for herself, out of the city's hustle and bustle, in a small cottage in Maine. Life, the way it should be--filled with satisfaction and a great love. Inspired by her friend's Internet dating success she signs up herself and finds a likely candidate living in a small coastal Maine town. Distracted by being in love with love, she makes a colossal mistake at work that leaves her jobless and Angela packs up her life and drives up to Mount Desert Island to be with 'her man' and find a better life. 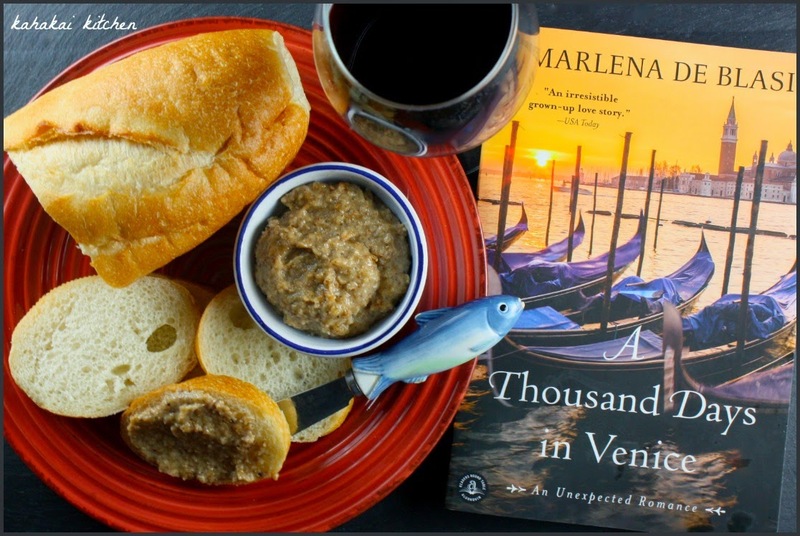 Her experiences don't come close to to her fantasies but she begins to find friends in the small community and she dives into her passion for cooking by creating pastries and soups for the coffee shop she works at and teaching cooking classes. 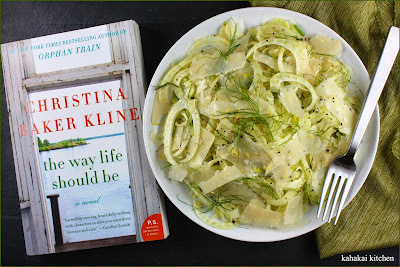 This is my third Christina Baker Kline reprint review and my favorite of her books so far, mostly because of all of the food. Angela cooks like I do with il regalo as her grandmother or Nonna calls it, loving to take the bones of a recipe and instinctively making changes that make it your own. I devoured the food she made from both from her own recipes and ideas, and those of her Nonna. I love a good start-life-over-and-change-your-destiny story and this book delivers. Angela is likable and Nonna is the Italian grandmother everyone wants. I became very fond of the quirky group of fellow transplants that Angela befriended in Mount Desert Island and I would have liked even more of their stories. 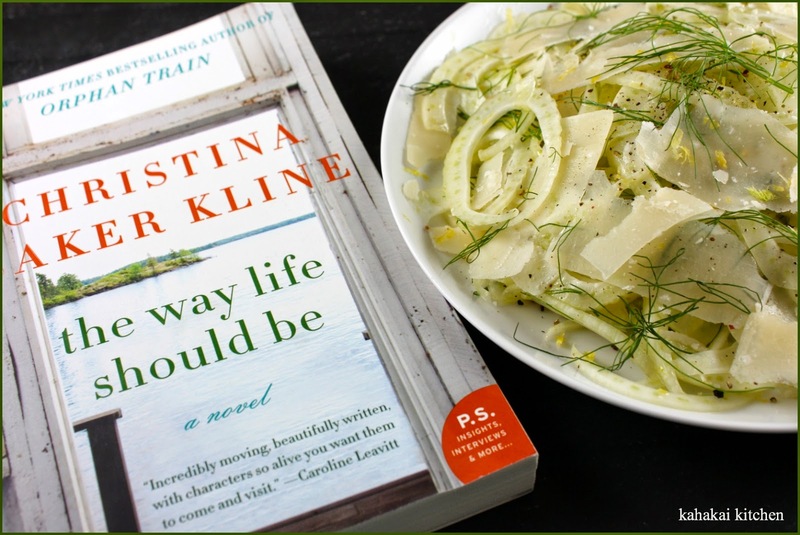 The Way Life Should Be is foodie chick-lit, not at all deep, but warm, fun, and a quick read to curl up with over a big bowl of pasta or maybe a plate of fennel salad. Author Notes: Christina Baker Kline was born in England and raised in Maine. 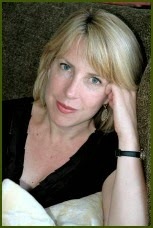 The author of five novels, including the runaway bestseller Orphan Train, Kline has taught literature and creative writing at Yale, New York University, and Fordham. She lives outside of New York City. 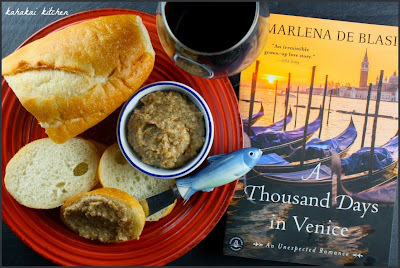 There is of course no shortage of food inspiration in this book--baked goods, many soups, and classic Italian dishes handed down from Angela's Nonna. There are recipe 'sketches' throughout the book and listed in the back, and close to a dozen actual recipes. Although I was tempted by Nonna's Potato-Crusted Sole and Pasta e Fagioli, it was the simple fennel salad that reeled me in. Part of Angela's cooking class/group's 'White Christmas' dinner (the salad plus Tuscan White Bean Puree and a White Bolognese), I enjoyed it on its own as a perfect dish for a warm and humid night. 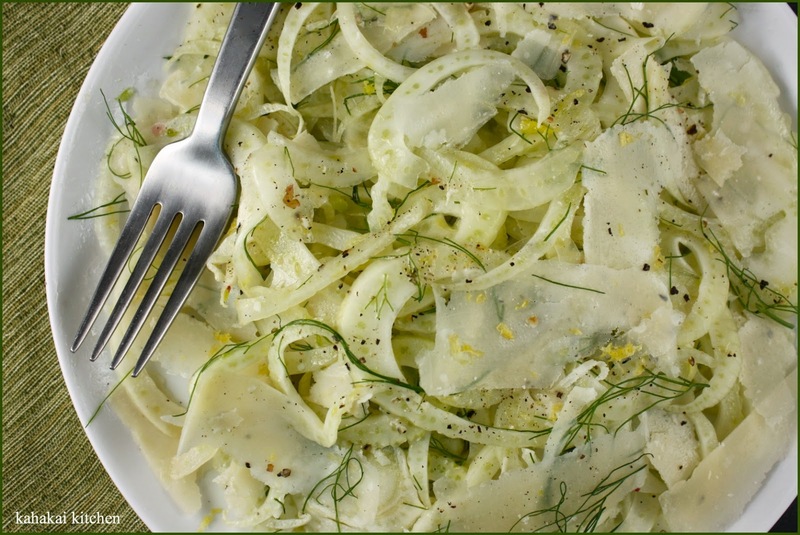 "The fennel salad is simple, I slice the bulbs into thin sheets and add a generous amount of Parmigiano-Reggiano shaved to slivers. 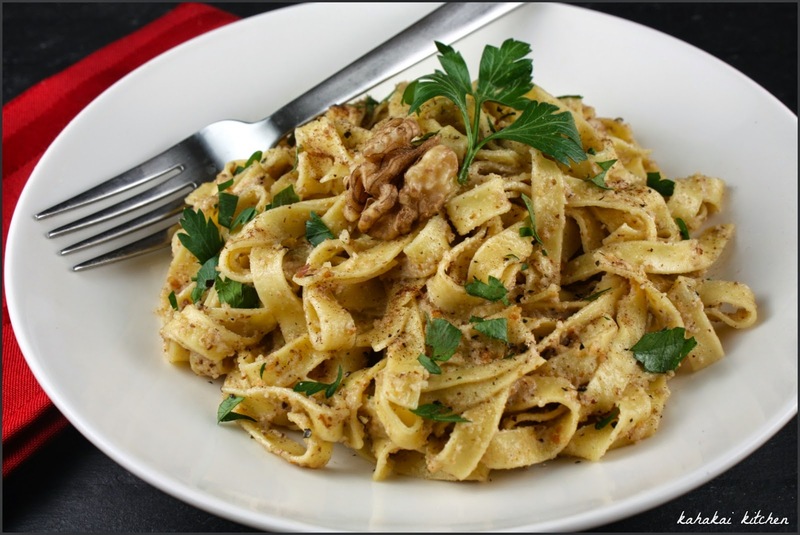 Lemon juice and extra-virgin olive oil whisked into a vinaigrette , along with freshly ground pepper, complete the dish." Deb notes: I like to add the extra fennel fronds for a spot of color and I also zested the lemon and added the zest to the salad. Notes/Results: I love fennel and I especially enjoy it with Parmesan and lemon. 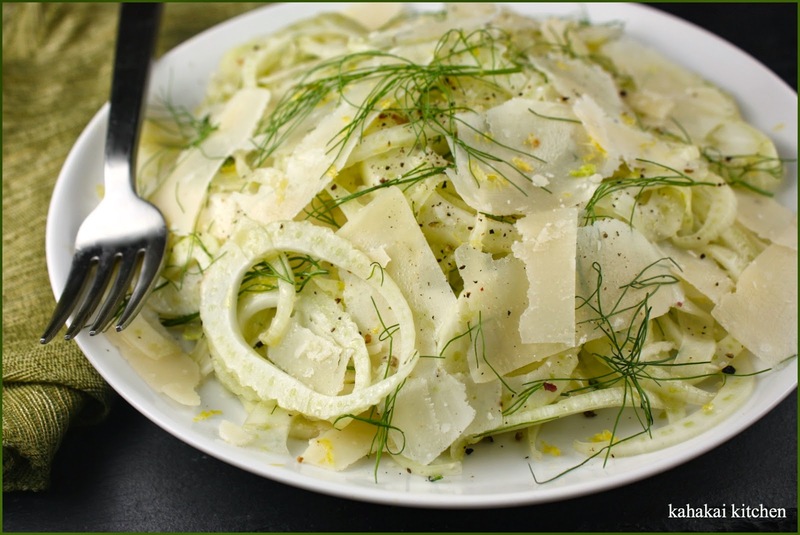 There is something about that cooling licorice/anise flavor of the fennel that is a heavenly match for the rich and salty Parmigiano-Reggiano and the tangy, freshness of the lemon. This salad is perfect as a starter, a side for fish or if you are me--just gobbled up from the mixing bowl as dinner. I will definitely make it again. 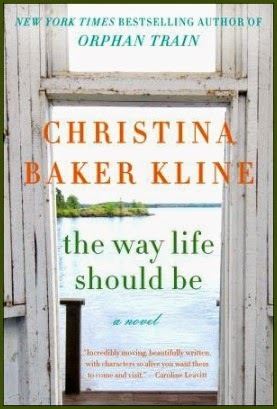 Note: A review copy of "The Way Life Should Be" was provided by the publisher and TLC Book Tours in return for a fair and honest review. I was not compensated for this review and as always my thoughts and opinions are my own. 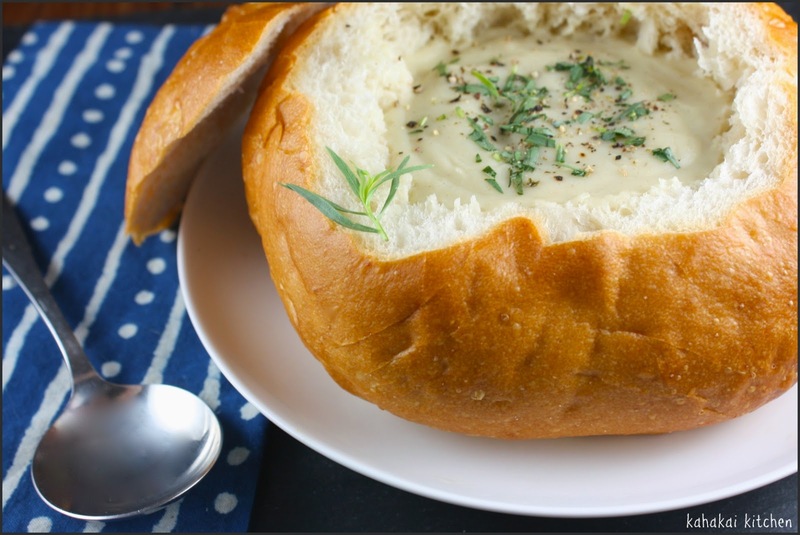 Can there be five more beautiful words than 'soup in a bread bowl?' I think not. Especially when that soup is creamy and full of wonderful flavor. This one manages to be all that without any dairy, getting its smooth consistency from the pureed cauliflower. Its flavor comes from the tarragon remains that I didn't want to waste away in my veggie crisper and a 'secret' ingredient--Old Bay Seasoning. It's not just for seafood and I find myself slightly obsessed with the slightly smoky/spicy notes. 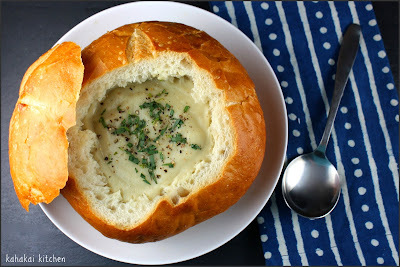 My local grocery store has these sour dough bread bowls for $1.69 so I couldn't resist filling one with this soup--although if you are eating gluten free, this soup is just as good in a bowl. Heat olive oil in a soup pot and add onion, sautéing about 5 minutes until softened and translucent. Add tarragon and Old Bay seasoning and sauté for another minute or two. Add bay leaf, cauliflower and veggie broth and bring to a boil. Reduce heat and simmer about 20 minutes or until cauliflower is tender. Purée using blender (carefully in batches) or handheld blender in soup pot until smooth. Season to taste with salt and black pepper. Serve with a scattering of chopped fresh tarragon and freshly ground black pepper on top. 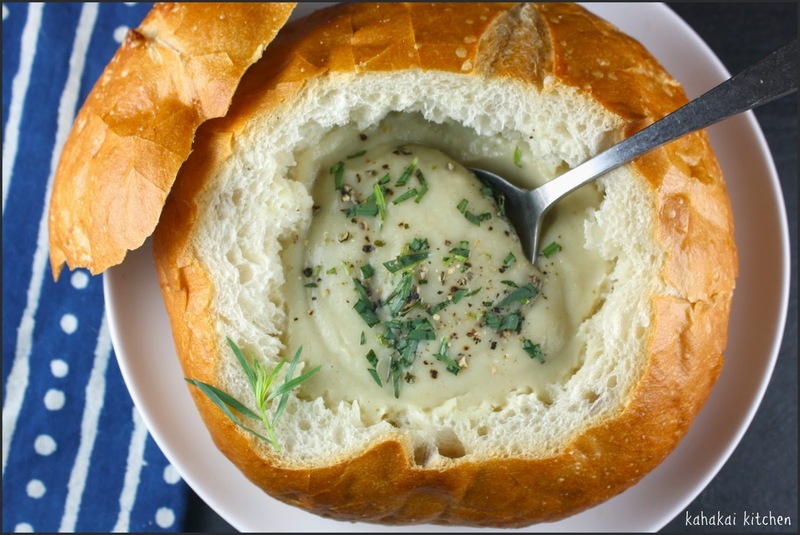 Serve in a bread bowl or with bread for dipping. 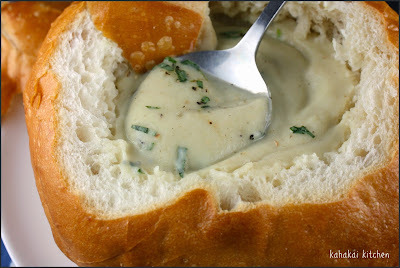 Notes/Results: Thick, silky-creamy and quite good for such a simple soup. The Old Bay adds depth of flavor while the tarragon gives it that little slightly bittersweet anise flavor that pairs well with the cauliflower. A good quick soup when you want something satisfying without dairy--it feels indulgent but is healthy. 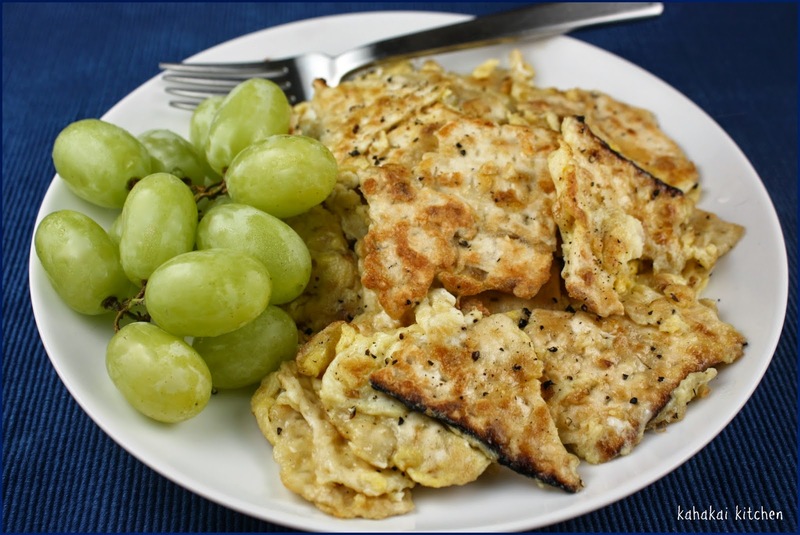 Cauliflower is a good source of vitamins C and K as well as other nutrients and is a good source of fiber--so eat up! I would make this again. 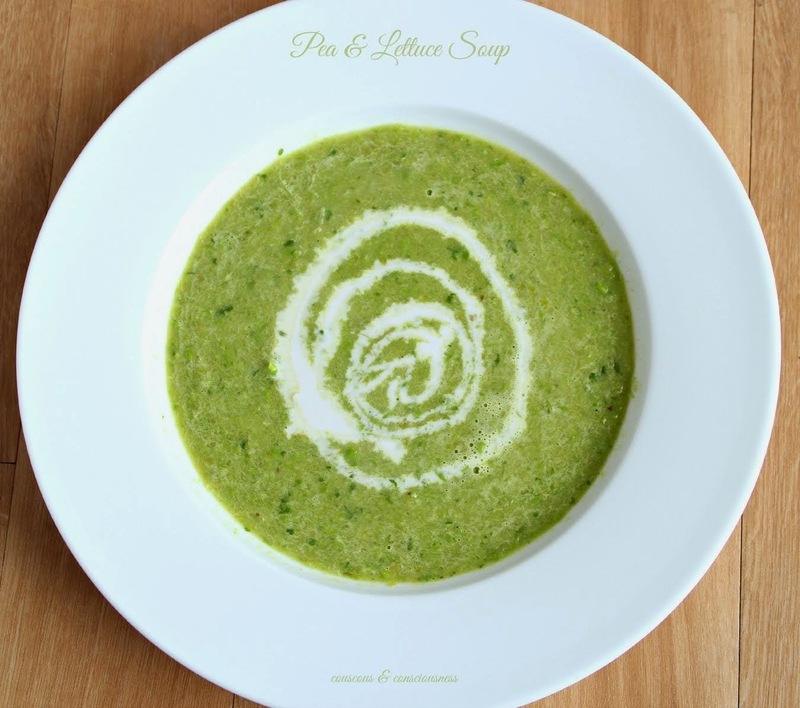 We have some great friends and their delectable soups and salads waiting in the Souper Sundays kitchen, let's have a look! I love a big bowl of flavorful laksa and Joyce of Kitchen Flavours has me craving her take on Nigel Slater's Pumpkin and Tomato Laksa. Joyce says, "Simple and easy to cook. Though it does not exactly taste like our local laksa which is really rich and spicy, this bowl of mild laksa makes a nice meal. This is the first time I'm using pumpkin in a noodle laksa, and it makes such an interesting ingredient. The hard-boiled eggs and fish balls are my addition. Some cooked chicken meat may be added for a more substantial meal." 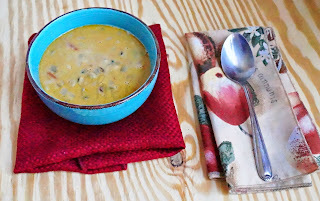 I've missed Debbie of The Friday Friends at Souper Sundays and I am happy to have her back this week with a decadent Cheeseburger Paradise Soup. She says, "The Handyman LOVED this soup....and he is not a soup lover (he puts up with me because I do love it). He raved about it, which can only mean a couple of things: 1. It was really good 2. It was filling and hearty (emphasis on the filling, because that is his beef with soup usually. He feels it's more of a first course). He said, and I quote: 'it has beef, potatoes, and cheese and bacon, what more do you need?' He is right. What more do you need?" My friend and fellow IHCC co-host Sue of Couscous & Consciousness made Nigel Slater's Pea & Lettuce Soup and says, "This recipe is ridiculously quick and easy to make, deliciously fresh, and light enough that you could actually serve this as part of a multi-course meal. I seldom have soup other than as a meal in it's own right, but this one could definitely fit into a bigger meal without filling you up too much. It's pretty and elegant, and I wouldn't hesitate to serve this to company. I hope you'll give it a try." Mireille of Chef Mireille's East West Realm has both soup and a salad to share this week. First, Coconut Milk Bean Soup from Tanzania. She says, "The flavors in this soup reminded me a lot of Bahia soups and stews. Bahia is the coastal Atlantic coast of Brazil where the African descended community of Brazil is concentrated. 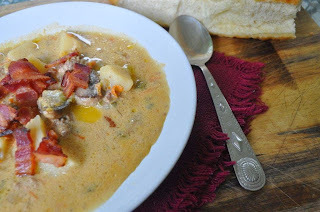 The flavors in this reminded me of Bahia seafood stews which I have made in the past. The Bahia also eat black eyed peas a lot. 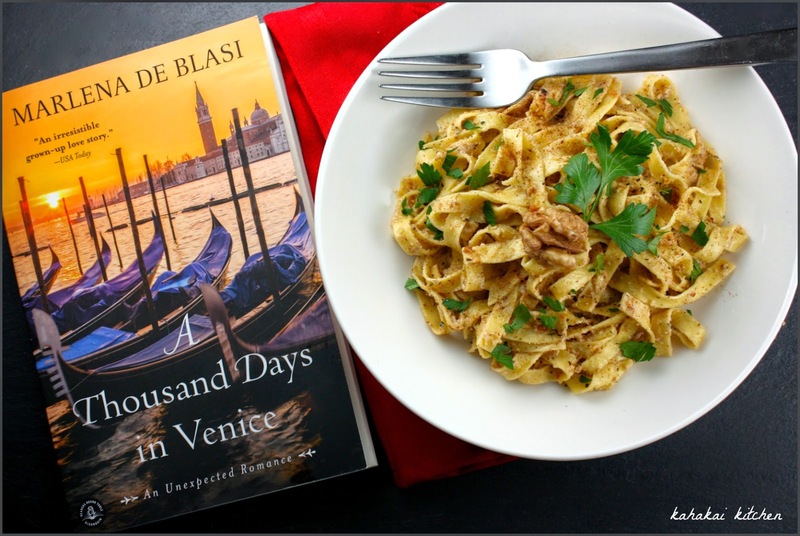 You can't help but consider the African cuisine stayed intact although traveling so many miles and over oceans." 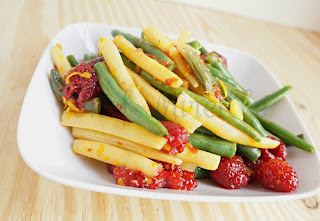 Next, Mireille made Green Bean Raspberry Salad and says, "Inspired from an Asparagus & Orange Salad in my The Best Ever Vegetarian Cookbook, I used the dressing recipe from the book, but changed the major elements of the salad. By using smoked paprika, it adds a Spanish flair to this simple salad. Although I've blanched the beans in this salad, I also like green beans raw...in fact I was snacking on them on the 2 hour train trip back to the city... and you can also make this salad with raw green beans." 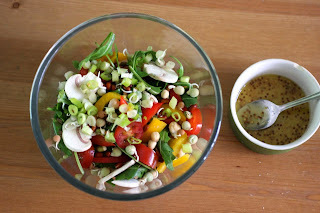 Johanna of Green Gourmet Giraffe Blog stops by this week with a bright and colorful Simple Salad with Sprouts. She says, "On a bad day, lunch is a peanut butter sandwich. Sometimes I am quite proud of my lunch. This salad started with a craving for bean sprouts. It was just what I wanted. Leafy, colourful, crunchy, juicy, sharp and sweet. It is a bit like the crunchy salads that I posted about years ago. I still make those sort of salads occasionally and this is one of them." Pam of Sidewalk Shoes shares two salads this week. First her Balsamic Roasted Beets, Quinoa and Kale Salad. 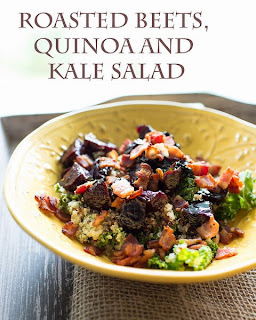 Pam says, "If you are looking for a gorgeous fall salad, you have come to the right place! Just look at those beets! They look like candy and they tasted like candy! If you have never roasted beets with balsamic vinegar you are in for a treat (this recipe even ups the candy factor by including brown sugar). The quinoa and kale are balanced perfectly by the sweet beets. The original recipe called for speck, but I subbed bacon – close enough! If you are not a meat eater, just leave off the bacon, this would still be good!" Pam's second dish is this Roasted Acorn Squash Salad with Warm Goat Cheese Rounds. She says, "Oh yes, fall. Love it. I especially love seeing all the winter squashes start appearing and thanks to my CSA, I had another gorgeous acorn squash to work with. You know what’s another thing I love? Cheese. 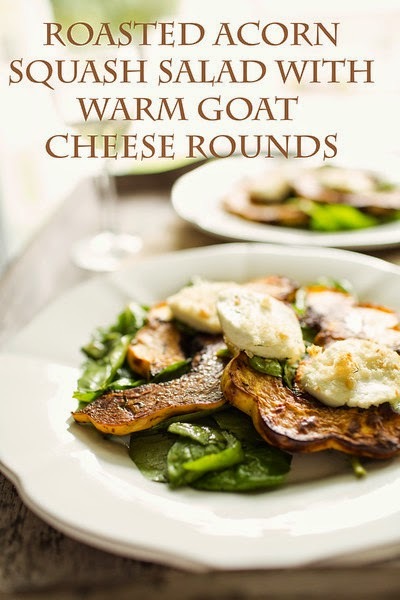 Goat cheese in particular. Toss some warm (yes warm!) 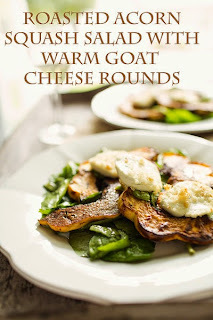 goat cheese rounds on a salad and I don’t even quibble about the missing meat." Thanks to everyone who joined in this week. If you have a soup, salad, or sandwich that you would like to share, just click on the Souper Sundays logo on the sidebar for all of the details. Like many bloggers, I get periodic requests to attend a media event or try out a new restaurant. I don't do it a lot. Often it is due to time constraints, sometimes due to the type of restaurant--for a mostly-veggie-with-some-fish-thrown-in blog, I get a lot of steakhouse and meat-centric invitations. 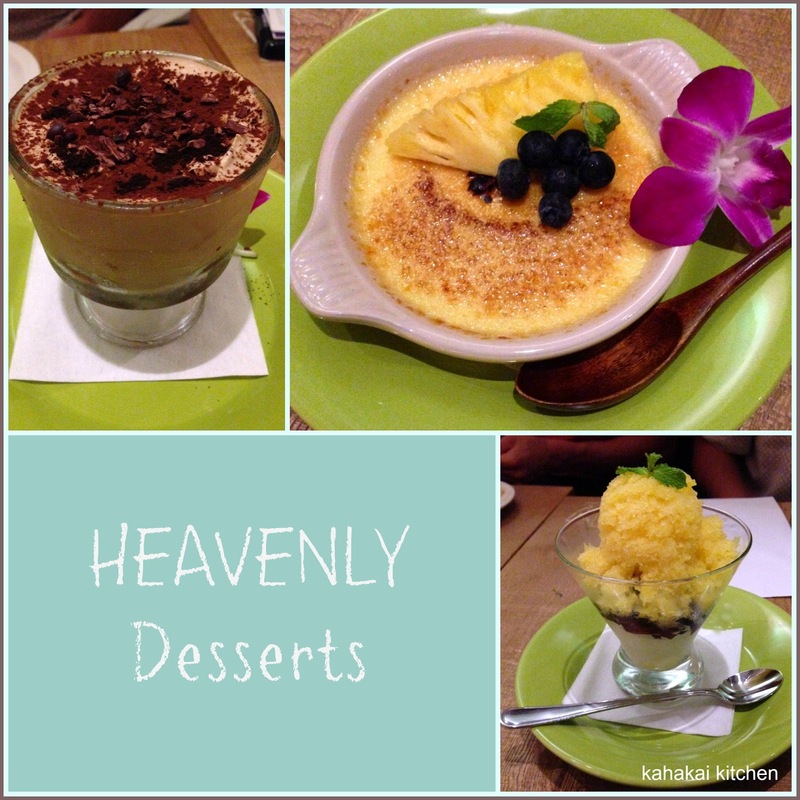 ;-) When the email for the new Heavenly Island Lifestyle Restaurant came through, I was immediately attracted to the philosophy and the menu. 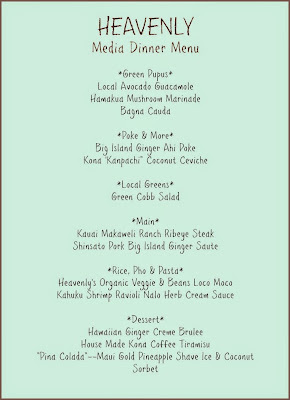 A 'health-conscious menu reflecting the richness of Hawaii and using local and organic ingredients' is something I can get behind. So, I asked if I could bring my favorite foodie friend Natalie along, and Monday night we met up with a dozen or so bloggers, food and travel writers, and other foodie types to check it out. 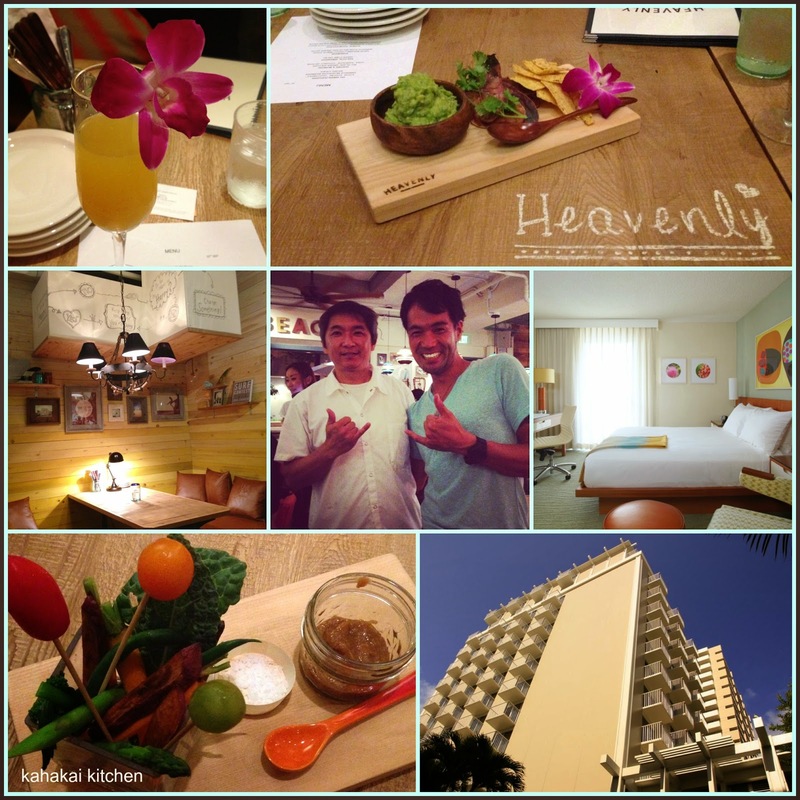 Heavenly restaurant is at the Shoreline Hotel Waikiki, a hotel that was purchased and renovated as a boutique hotel by the popular Joie de Vivre Hotel group about a year ago. Both the hotel interior and the restaurant have a beachy, surf chic feel. I neglected to get (iPhone) photos of more than the food (yes, I have a one-track mind and stomach) but Natalie got a lot of great interior shots (check her photos out on Twitter @asknatalie and Instagram asknataliehawaii). The restaurant had a soft opening about a month ago and has been serving breakfast and lunch. Monday night they were very brave to host a media dinner on their very first night of serving their dinner menu. We were welcomed with a variety of tropical fruit mimosas (mine was mango) and given an extensive tasting menu with shared plates of thirteen of their menu items. The actual restaurant menu was provided with the details of each dish with local and organic items clearly called out. The back of the restaurant menu features the different local vendors that the restaurant sources the bulk of their ingredients from. Plating of the dishes was fun and in keeping with the surfer chic vibe of the restaurant. 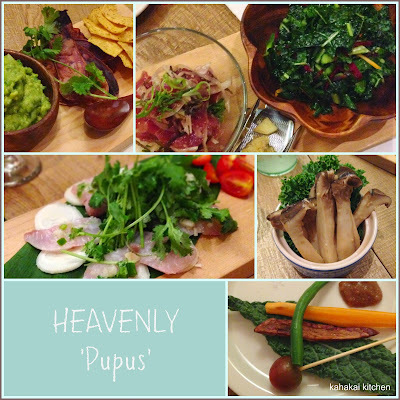 The pupus--appetizers came out on wooden boards inscribed with the restaurant name. Heavenly's take on a bagna cauda featuring a miso paste instead of garlic oil for dipping had a small glass "vase" filled with a bouquet of fresh veggies for dipping. The poke came with a kale salad, a chunk of fresh ginger and a grater to add the amount of ginger you like. Being a big ginger fan, I appreciate being able to add a lot to my dish without worrying about any less ginger-loving dining companions. The guacamole was chunky and fresh and served with cilantro, taro chips and corn chips. I think the chip amount could be increased a bit--especially for sharing. It's hard to make mushrooms look pretty but the meaty Hamakua mushrooms made this mushroom addict very happy. The standout appetizer dish for me was the Kona 'Kanpachi' Coconut Ceviche. The kanpachi (aka kampachi, amberjack, yellowtail), was fresh and buttery, the disks of Big Island hearts of palm added a nice crunch beneath, while the coconut oil, cilantro and lime made a flavorful dressing. There was a bit of a wait between courses but given the number of dishes for our group, the fact that this was their first night of dinner operations, and that they were serving a decent-sized crowd of customers too, the kinks in service speed were expected. It looked like food was coming out in a timely fashion for the bar and smaller groups. The service was friendly, my water glass was constantly filled and the (organic) wine was plentiful. We had good company at our table including John Henry, the Regional Managing Director for Joie de Vivre, fresh off the plane from San Francisco, Will McGough a free-lance travel writer (Wake and Wander) on a hiking adventure through the islands, and @saGEMom, from Hawaii Mom Blog and Sage and Savvy, a local blogger who I have followed on Twitter from a while now but had not had the pleasure of meeting until last night. Green Cobb Salad was next up--I didn't get a great shot of it mixed up but hidden in that forest of green were lentils and quinoa and the herby green dressing was light and complimented it well--another favorite dish for me. (I hid my pre-mixing photo in with the main dishes above.) Speaking of our Main Dish and "Rice, Pho & Pasta" courses, there was sauteed Shinsato pork with (more yea!) mushrooms and onions in a very lickable ginger sauce. The Makaweli Ranch ribeye came out tender and was sizzling in a decadent truffle sauce with local veggies. If you regularly read this blog you know I am no longer a regular meat eater but, I make an exception for tasting menus and I had a bite of each of the meat options to try them out. (How I suffer for my art!) ;-) I also had a bite of the patty on Heavenly's Organic Veggie & Beans Loco Moco. Loco Moco is a Hawaii classic and Heavenly's take on it--with a 10-grain rice and black bean mixture and a ginger and soy glaze instead of gravy, was fabulous. The egg was cooked perfectly--as you can see from the photo as it was cut open. I would return for this Loco Moco--but for my veg-friendly soul, I would ask to order it with more vegetables and no patty. I would have liked a bit more herb flavor or acidity to balance all of the creamy in the Kuhuku Shrimp Ravioli but I liked the cauliflower on top. It could also be that even sharing plates, I was getting pretty full by the time the pasta hit the table so was looking for something that 'popped' more in flavor. As stuffed as we were getting, we did manage to squeeze in tastes of the three desserts. I liked that the House Made Kona Coffee Tiramisu was not too heavy and that there wasn't an overpowering harsh rum flavor that you get in some tiramisus. In this one the coffee and chocolate flavors were at the forefront. The 'Pina Colada' had coconut sorbet on the bottom and a Maui Gold pineapple shave ice on top with jelly cubes (coffee jelly?) in between--a good combo of sweet and tangy and not too heavy. Having a love for both crème brûlée and ginger--I had a feeling it would be my favorite dessert and I was right. The ginger was present without being overpowering and it was light and creamy. As we were enjoying the last bites of dessert, our host "Mild" (Makoto Hasegawa), Heavenly's manager, brought out the Executive Chef, Keigo Yoshimoto (see center photo of first collage). 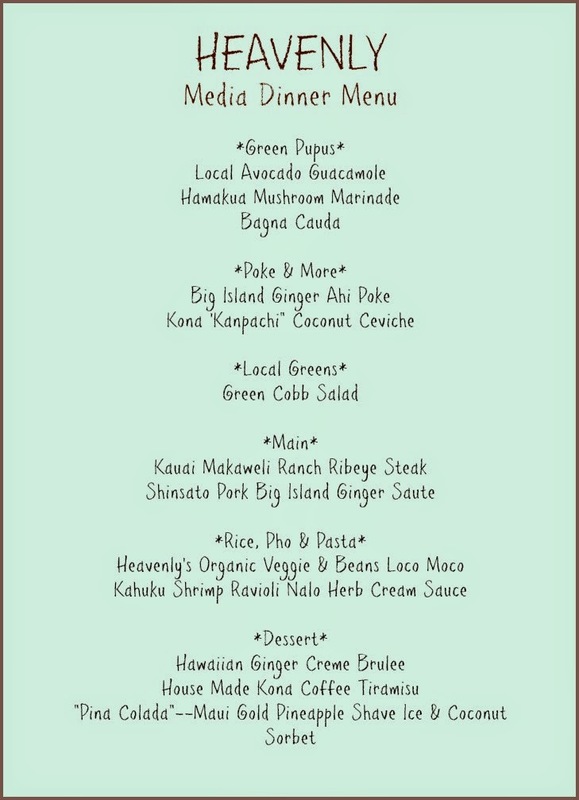 Chef Yoshimoto is the chef for the Aloha Table Group --including Aloha Table and Goofy Cafe & Dine (both in Waikiki). The chef's attention to detail and Mild's attention to service made for an overall delicious and fun evening. Note: My friend and I were hosted at a media dinner by Heavenly Restaurant and Shoreline Hotel Waikiki, a Joie de Vivre, property in return for a fair and honest review. I was not compensated for this review and as always my thoughts and opinions are my own. 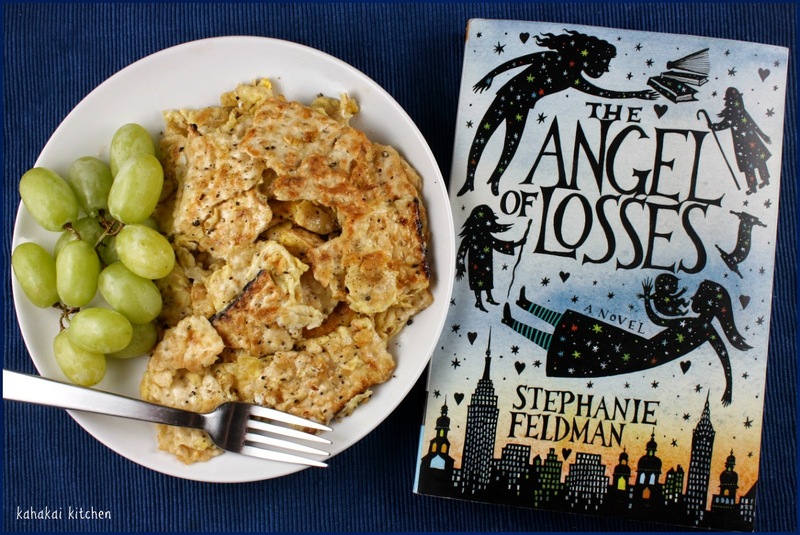 Jewish folklore, history, sisterly relationships and family secrets come together in the mystical novel, The Angel of Losses by Stephanie Feldman. 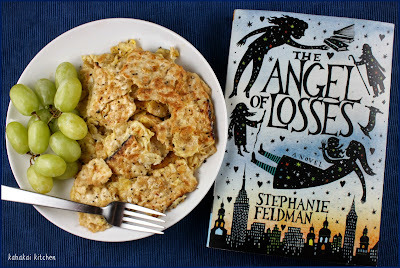 I am happy to be reviewing it today and serve it up with a breakfast of Matzoh Brei, a dish inspired by my reading as a stop on the TLC Book Tour. The Tiger’s Wife meets A History of Love in this inventive, lushly imagined debut novel that explores the intersections of family secrets, Jewish myths, the legacy of war and history, and the bonds between sisters. When his granddaughter, Marjorie, discovers Eli’s notebook, everything she thought she knew about her grandfather—and her family—comes undone. 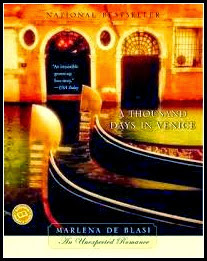 To find the truth about Eli’s origins and unlock the secrets he kept, she embarks on an odyssey that takes her deep into the past, from 18th century Europe to Nazi-occupied Lithuania, and back to the present, to New York City and her estranged sister Holly, whom she must save from the consequences of Eli’s past. I grew up without a strong cultural or religious identity so I have fascination for stories or books that give me a glimpse into a these worlds. 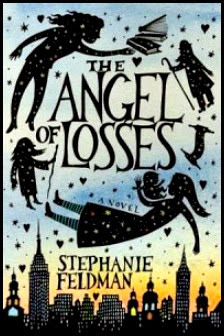 The Angel of Losses is steeped in religion, history and Jewish culture and moves back and forth between current day and the past. The book starts with a grandfather telling a story to his granddaughters about the White Magician--a story that results in nightmares for Holly, the younger sister, and frustrates Marjorie, the older one. Forward to current day, a grownup Marjorie is earning her PhD and writing her dissertation on The Wandering Jew, a traveling sorcerer. Holly has married, converted to Orthodox Judiasm and is heavily pregnant. The once close sisters are now vastly different and have grown apart. When Marjorie comes across one of her grandfathers notebooks with a story of the White Magician, or White Rebbe, she becomes obsessed with finding the rest of his notebooks, uncovering her grandfather's and her family's secrets and helping her sister and repairing their relationship. This book is not what I would call an easy read--it takes some time to dive in and some effort to keep all of the details straight. I had a slow start with it because I tend to do the bulk of my reading at night before going to sleep and I have had a crazy few weeks where I have been mentally exhausted writing a workshop and prepping for a trip next week to facilitate it. A sleepy Deb and this book were not a good match--I kept getting confused on what was past, what was present, what was real, what was a story, a fantasy, or a dream, and even who all of the characters were. When I finally got my materials turned in this past weekend and could focus (and sleep), I found myself totally absorbed in the story. It still made me scratch my head a few times but the stories that Eli told were beautiful and the relationship between Marjorie and Holly seemed very real. A book to sink deeply into if you like folklore, religion, cultural heritage and family dramas. 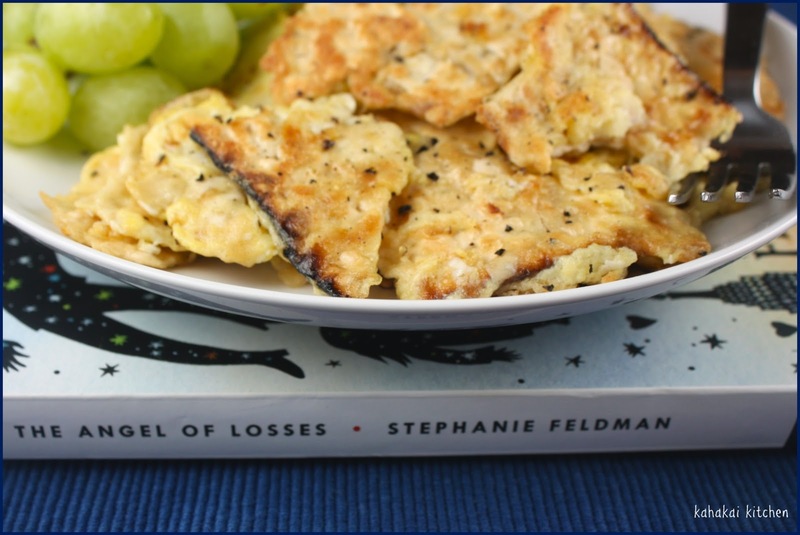 Stephanie Feldman is a graduate of Barnard College. She lives outside Philadelphia with her husband and her daughter. 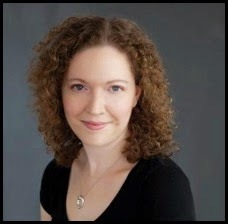 You can connect with her on her website. 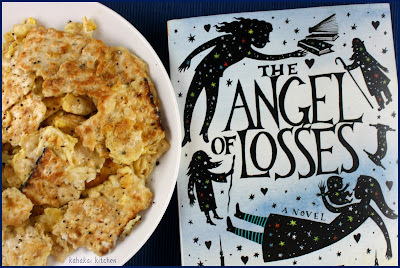 In looking for a dish to represent the book, I actually went to a dish I having been wanting to make ever since seeing Ruth Reichel's recipe for it. Matzo Brei (which translates to 'fried matzah'), doesn't have much to do with the story--other than being a Jewish comfort food dish, although Grandpa Eli did take Marjorie and Holly out for breakfast regularly when they were young, and there were a few mentions of eggs in the story. 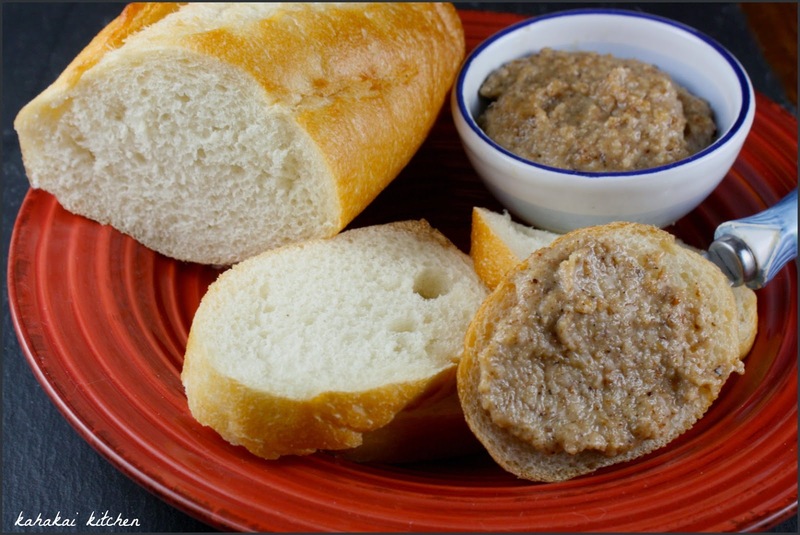 But, when Ruth Reichel calls something "one of life's perfect foods"--you know you should give it a try. Notes/Results: Simple but pretty darn tasty, I can see matzoh brei becoming a regular thing on my breakfast rotation--at least until the box of maztoh is gone. 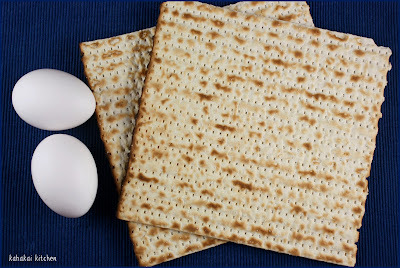 ;-) I really liked the chewy/crispy pieces of matzoh in the scrambled eggs. Reading the reviews for Reichel's matzoh brei online, there are many variations of preparation and family recipes with additions like onion, apples, raisins, cinnamon, sugar, etc. For me, black pepper is a must with eggs but I liked this simple version--not sure if a sweeter variation would appeal to me. I made two servings and halved the butter and reduced the salt--as no one 'needs' that much butter and sodium. ;-) I might not classify it as one of life's perfect foods but certainly a good one. 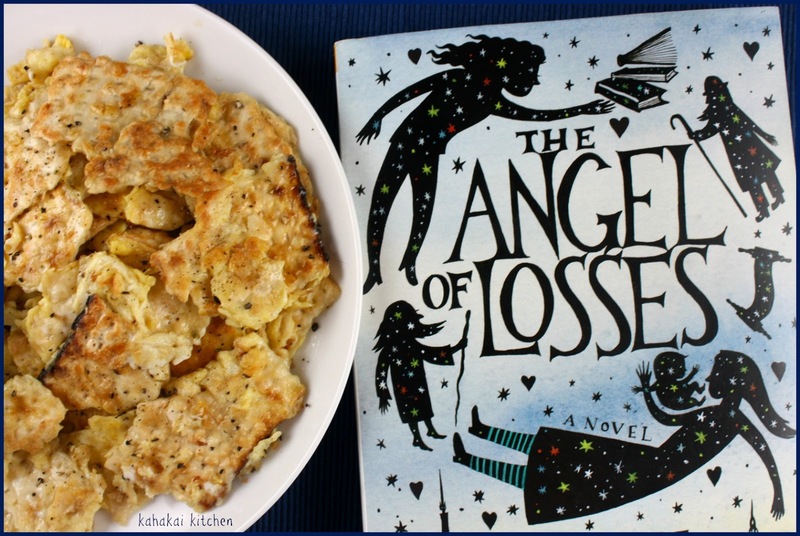 Note: A review copy of "The Angel of Losses" was provided by the publisher and TLC Book Tours in return for a fair and honest review. I was not compensated for this review and as always my thoughts and opinions are my own. This Quick Fish and Corn Chowder is subtitled as "a soup to warm the cockles of your heart." With the seemingly endless hot and humid weather we have been having, the cockles of my heart, or any other part of me are not in any need of warming. Still, there is something oh-so-comforting about a fish chowder, studded with new potatoes and fresh corn, regardless of the weather outside. 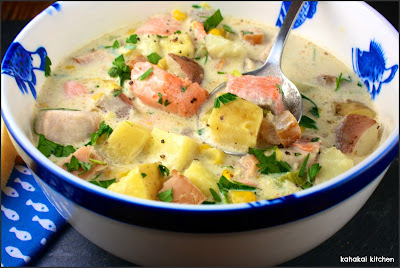 Nigel Slater has quite a few chowder-ish recipes, but I liked this one for its simplicity. 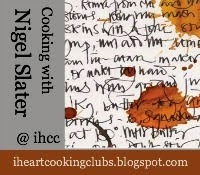 Nigel's recipes are always easy to adapt and a good starting place to jump off from. My additions / changes to his recipe sketch are noted in red below. Scrub 400g (14 oz) of new potatoes, then halve or quarter them depending on their size. Peel and roughly chop an onion, put it in a large deep pan, then add 500ml (17 oz) of water and 500ml (17 oz) of milk. Bring to the boil, with a coarse grinding of pepper and a couple of bay leaves. 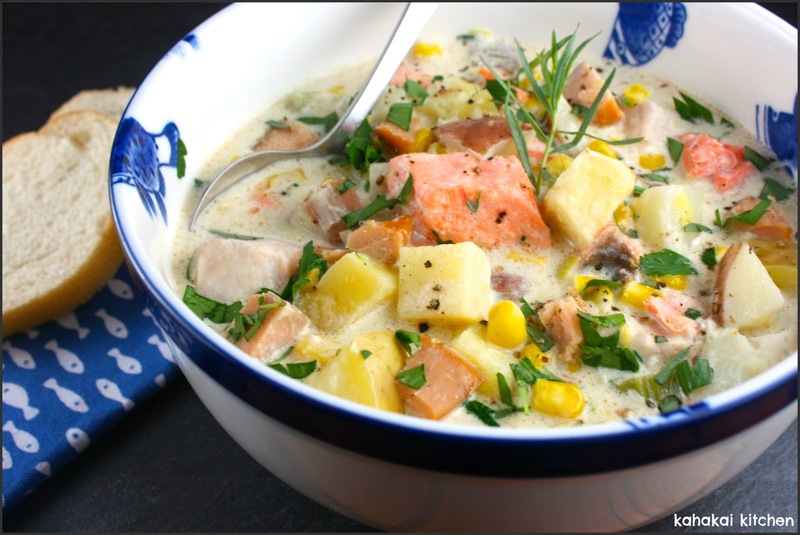 Lower the heat so the liquid simmers and, when the onion is soft, introduce 400g (14 oz) of mixed fish, such as salmon, cod and smoked haddock cut into large cubes, and continue to cook on a low heat for 10 minutes. Slice the kernels from a head of sweetcorn and drop them into the pan. Roughly chop two spring onions and a small bunch of parsley, and stir them into the soup carefully, without breaking up the fish, then serve as soon as the corn is tender. You could use one of the ready-prepared assortments of fish meant for fish pie if it is more convenient. 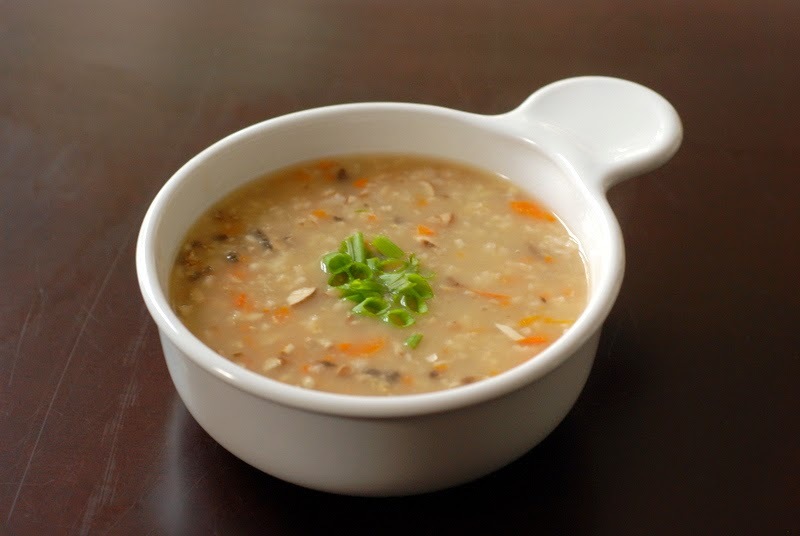 The soup is a calming, delicate version, but sustaining enough to be a light main dish. 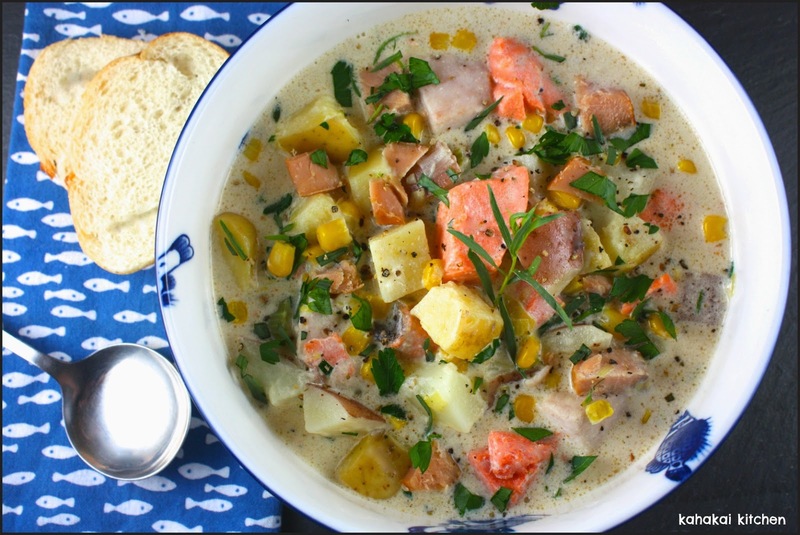 It is important not to stir the chowder too much as it cooks, which would result in the fish breaking up. I sometimes like to add a handful of mussels or clams to the soup once the fish has almost reached tenderness. 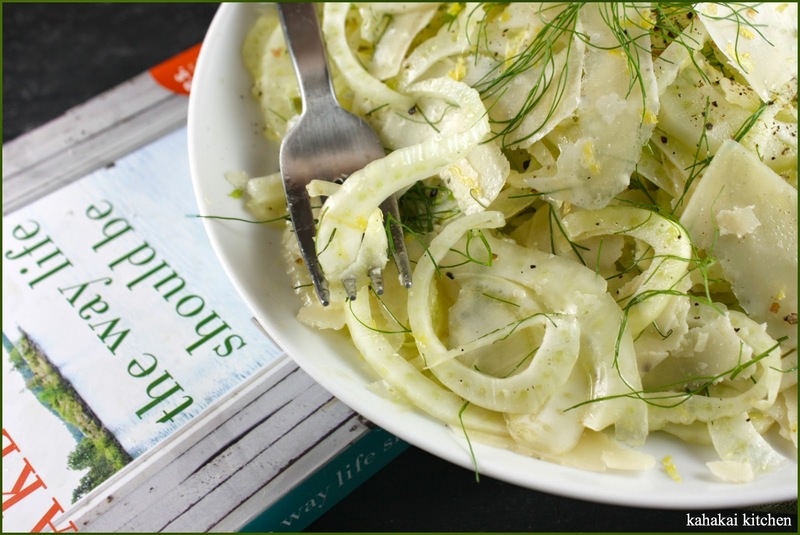 Finely sliced leeks can work well instead of the onion. To give the soup a sweeter note, cook the onion or leek in a little butter and oil until it is soft, before adding the milk. You could stir in a little tarragon or dill, finely chopped, into the soup near the end of the cooking time. 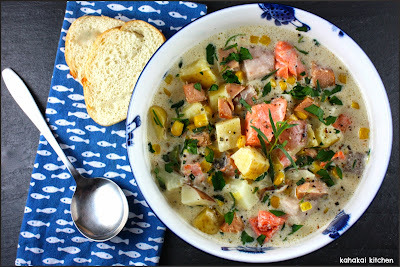 Notes/Results: Simple but still chowder nirvana in my book--flavorful and indulgent. I like my chowder served in a big deep bowl to spoon down into and accompanied by a couple of slices of baguette to soak up the broth. And this broth is rich and velvety and very soak-up-able and the smoky spice of the Old Bay Seasoning just peeks through. I love the different textures of the fish--the salmon is silky, the Opah, firmer, and the little pieces of smoked salmon slightly chewy and bursting with flavor. The veggie base is good with the firmer celery and corn, with the onions and leek softer and smoother. The pop of flavor from the tarragon works well too. Yep, this bowl of chowder made me very happy--quick, simple, gorgeous to look at and a taste that makes you want to lick the bowl. I would definitely make it again. This bowlful of goodness is being linked up to I Heart Cooking Clubs this coming week for the Ladle It Up! theme--featuring soups, stews, curries, etc. You can see what everyone put into their bowls by checking out the picture links on the post. We have soups and salads and good friends waiting in the Souper Sundays kitchen, let's have a look. Janet of The Taste Space shares this made-with-oats bowl of Mushroom Ginger Congee and says, "Traditionally congee is made with rice to make a porridge-like consistency and flavoured and garnished with as much or as little as you want. I noticed Kate Lewis’ photo in the book had additional mushrooms and green onions as garnishes, so I added that to mine. Not merely photogenic, it added a nice depth of flavour, too. I think a bit of toasted sesame oil would be lovely, too. 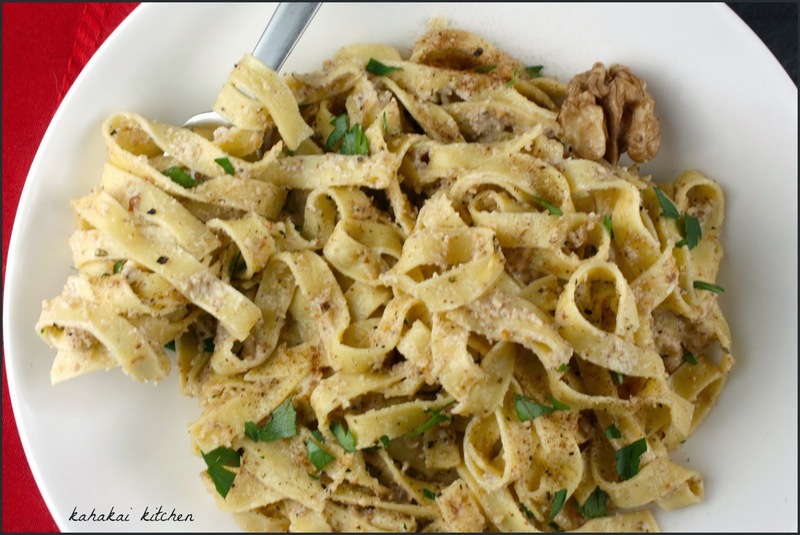 I was never super convinced oats could hold savoury flavours so well, but this was delicious." It is always a treat to have my friend Kat of Our Adventures in Japan pay a visit to Souper Sundays. She made "Using Up the Veggies in the Fridge (and Lanai) Soup." Kat says, "Last week, I had wanted to use up all the veggies in my fridge. ... Envisioning fried renkon (lotus root) chips, I fried thinly sliced pieces. Unfortunately, I drained them on a paper towel and they kind of steamed, so they weren't too crispy. After setting aside the renkon, I sauteed some kale from the lanai with some red bell pepper in some olive oil. 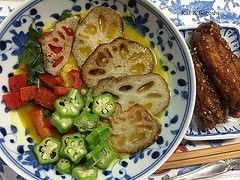 I ladled a bowl of the pumpkin soup and then topped it with the renkon, kale, red bell and then sliced some okra. Dinner was served." Mireille of Chef Mireille's East West Realm has a soup and salads from Burma/Myanmar to share this week. 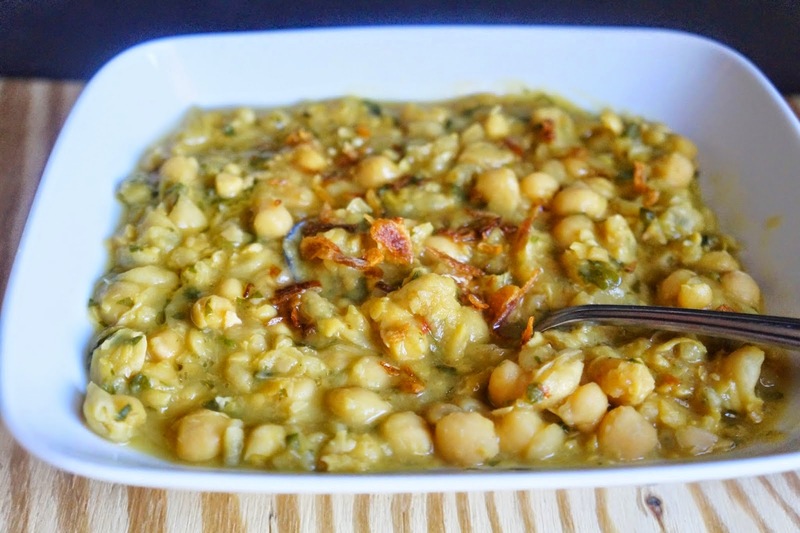 First, this Burmese Chickpea Soup. She says, "It is a taste bud tantalizing explosion of flavors. 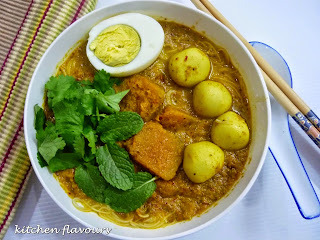 ... Soups and salads form the backbone of Burmese cuisine. On a recent repeat episode of Anthony Bourdain's No Reservations, it was interesting to note the variety of salads and sauces served with soups and curries. A variety of pickled and fresh salads were added to curries and soups to give Burmese food their complexity of flavors. Up to a dozen different salads and condiments is not uncommon to accompany meals." Topping Mireille's soup are two Burmese salads--Long Bean Salad and Grated Carrot Salad and some traditional condiments. She says, "While Burmese soups and curries for which they are known are flavorful, what gives them their umami is the large variety of condiments and salads that their foods are topped with. Here are just a few to give your food the umami achieved with the cuisine from the republic of Myanmar. These were very familiar to me as many of these are also used in Indonesian cooking which I am familiar with due to my Indonesian family and I enjoyed this meal thoroughly." 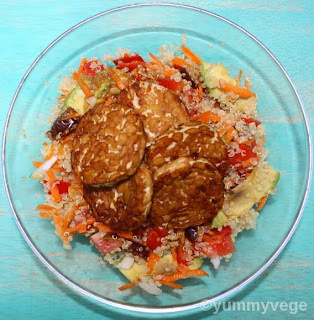 Joanne of yummyvege is back this week with a healthy and satisfying Fruity Quinoa Salad with Tempeh. She says, "I know you’re all getting into the autumn thing and eating pumpkin and thinking about taking your jumpers out of the cupboard, but here it’s still roasting hot, so I’m still eating summery food. Salads, things that require as little cooking as possible, there’ll be plenty of stews and baking in due course but for now I have another salad for you. This one is a great mix of sweet and savoury and it’s a complete meal. Both the quinoa and the tempeh contain protein and there are healthy fats in the avocado. The sweetness comes from the dates, the orange and the concentrated apple juice. And the best part is that it all comes together in about half an hour if you don’t count the marinading time." Pam of Sidewalk Shoes brings us two salads this week. 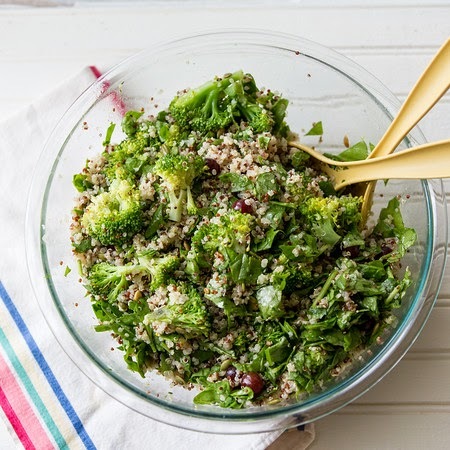 First, this hearty Broccoli Quinoa Salad and also shares her formula for a great grain salad saying, "It is composed of a grain, a veggie, greens, fruit, and nuts. So you could have a quinoa, broccoli salad with spinach, grapes and pumpkin seeds – like I have here. Or you could have a barley, carrot salad with kale, apples and sunflower seeds. See, how easy it is! For my dressing I use my standard juice of one lemon mixed with equal parts olive oil. But you could even vary that, substituting orange juice, or any type of vinegar for the acid. You could even change up the oil and use a nut oil, or sesame oil. The possibilities are endless!" Pam's second dish is a fall-ready Roasted Brussels Sprouts and Pears Salad. 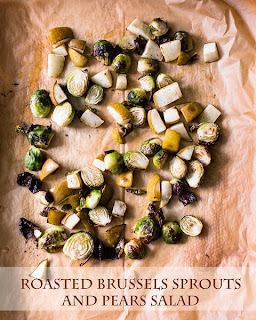 She says, "With my last CSA pickup, we received a couple of handfuls of brussels sprouts. Not enough to make a Brussels sprouts recipe. Since they looked so fall to me, I decided to mix them with another fall item – pears. 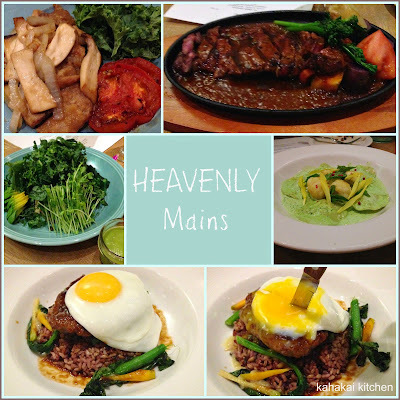 I thought that the flavors might complement each other – and they did. I realize that I called this a salad and you are looking at what looks like just some roasted pieces on parchment paper. What I had envisioned was then tossing these roasted Brussels sprouts and pears with some romaine lettuce and adding some dried cranberries and a light vinaigrette. I got lazy. I still think the salad would be yummy, but I just served these straight off the baking sheet and they were so good!"